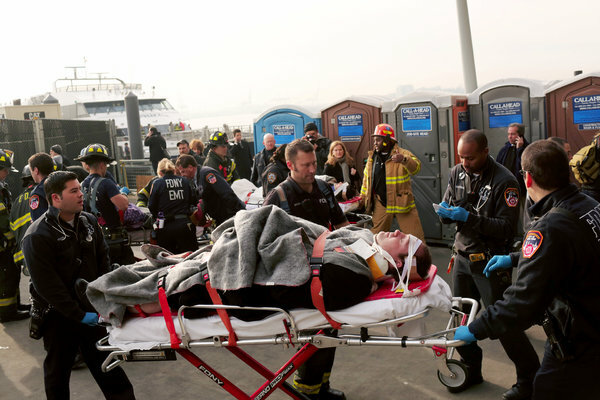 Dozens Injured In Ferry Accident In Lower Manhattan - kaycee Weezy! A ferry crashed as it was docking in Lower Manhattan on Wednesday morning, injuring several dozen passengers, according to fire officials. The cause of the accident, which occurred around 8:45 a.m. at Pier 11, at South Street and Gouverneur Lane, was not immediately clear, according to a spokesman for the New York Fire Department. A massive gash in the ferry could be seen, and passengers described a huge jolt as the ferry pulled into the dock. Nearly 60 people were hurt, according to emergency officials, and a number of passengers were taken off the boat on flatboards with their heads and necks immobilized. Janette Sadik-Khan, the New York City transportation commissioner, said two people were critically injured and nine others were being treated for serious wounds. Dozens of others sustained less severe injuries. Both passengers with critical injuries suffered head trauma, fire officials said. The closest hospitals, including Bellevue Hospital Center and NYU Langone Medical Center, are not fully operational as a result of Hurricane Sandy, and the injured were sent to several area hospitals, including one in Brooklyn. Ms. Sadik-Khan said that the ferry was moving at a steady clip – 11 to 16 miles per hour -- when it made its first impact with one of two loading barges that extend from the pier. The ferry then hit a second loading dock, she said. The ferry, operated by Sea Streak Ferry, provides daily service from Atlantic Highlands and Conners Highlands in New Jersey to Lower Manhattan, and can accommodate several hundred passengers. Charles Rowe, a spokesman for the Coast Guard, said initial reports indicated that there were 326 passengers and 5 crew members on the ferry. At the time of the accident, the ferry was approaching the dock and many people were standing, lined up and preparing to exit, which may have made it harder for them to brace at the time of impact. Passengers also reported confusion after the accident, with dozens of people scrambling to rush off the vessel. The most severely injured were thrown down stairs, officials said. None of the passengers were thrown into the frigid water, officials said. One passenger, Chris Avore, speaking to ABC News, said the impact was similar to what one might feel in a car crash. “Almost no one knew what was going on,” he said. The gash in the boat stretched several feet above the water line, and Mr. Barker told NBC that the ferry struck a loading barge, which extends from the pier and is used for passengers to get on and off the vessel. The ferry is 140 feet long and 30 feet wide. Photos provided by passengers to local news agencies showed shattered glass and other damage aboard the boat. The city has been working to expand ferry service along New York City’s waterways in recent years, and accidents are relatively rare. One of the worst accidents in the city’s history took place on Oct. 15, 2003, when a Staten Island Ferry missed its dock and hit a maintenance pier at full speed, killing 11 people and injuring 70 others. A pilot, who had been incapacitated at the time of the crash, pleaded guilty to manslaughter, but investigators also faulted training and enforcement of safety rules. Passengers said that as the ferry approached Manhattan on Wednesday, it seemed like a typical morning commute, with some passengers typing on their smartphones, others reading newspapers and some trying to catch a few last minutes of sleep. But when it reached the dock, they reported a sudden jolt, powerful enough to send people hurtling through the air. Even as paramedics tended to the wounded, some of those who were injured took to social media to describe what happened.